I had a minor catastrophe in the kitchen the other day. I was reaching into the back of the fridge and I knocked over a plastic container with a loose lid, spilling soup all over the fridge. As distressed as I was to have a real mess to clean up — the stuff seemed to get into every crevice of the refrigerator — I was almost equally upset to lose at least one serving of this wonderful soup! I got the recipe from my friend Greta Zalman, who served it at our monthly Shabbat study group lunch to rave reviews. She adapted it from a recipe she found online at allrecipes.com. You can use regular button mushrooms, but I really recommend Baby Bellas, which you can buy in bulk at Costco (you need a lot of mushrooms). The photo doesn’t do this soup justice — trust me, it’s delicious! Melt the butter/oil in large pot over medium heat. Cook and stir the onions in the butter until fragrant, about 5 minutes. Add the mushrooms and continue cooking until the mushrooms are tender, about 5 minutes more. 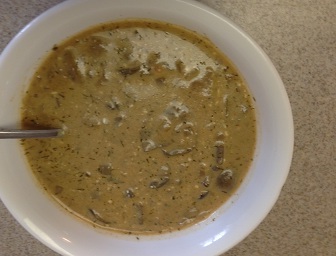 Stir the dill, paprika, soy sauce and vegetable broth into the mushroom mixture. Reduce heat to low, cover, and simmer 15 minutes. Whisk the milk and flour together in a small bowl. Stir the mixture into the soup. Add the tomato and the Hungarian wax pepper. Return cover to the pot and simmer another 15 minutes, stirring occasionally. Season with salt and pepper. Mix the sour cream into the soup and continue cooking and stirring until the soup has thickened, 5 to 10 minutes more. Remove the Hungarian wax pepper and tomato and discard before serving the soup.